by Lisa Vaughn, Culture Smart! 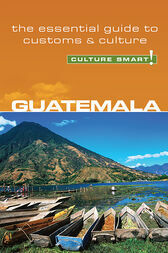 Title: Guatemala - Culture Smart! Author: Lisa Vaughn; Culture Smart! Lisa Vaughn is an American social psychologist. While gaining her Ph.D. from the University of Cincinnati, she trained in group interaction and relationships, organizational development, teacher-learning processes, and women's studies. Applying these disciplines to cultural studies–especially with Latino populations–she developed and led university study abroad programs to Guatemala from 2001 to 2005. She has lived and traveled in Guatemala for extended periods over the last six years, and has adopted a Guatemalan Mayan son. She is currently Associate Professor of Pediatrics at University of Cincinnati College of Medicine.